Acclaimed icon and synonym for Canadian modern dance, Peggy Baker, lights up the Betty Oliphant stage yet again with her newest work, Phase Space. The concept for the piece is intriguing— looking at how memory belongs in space and time, and exploring the place of memory within the body. We have all heard the term ‘muscle memory’, and Mrs. Baker has drawn on this in her choreography. The four individual pieces in this full-length show are comprised of reworkings of steps deeply ingrained in the dancers’ physicality from past works with the company. They are in charge of “excavating memories” with their bodies. 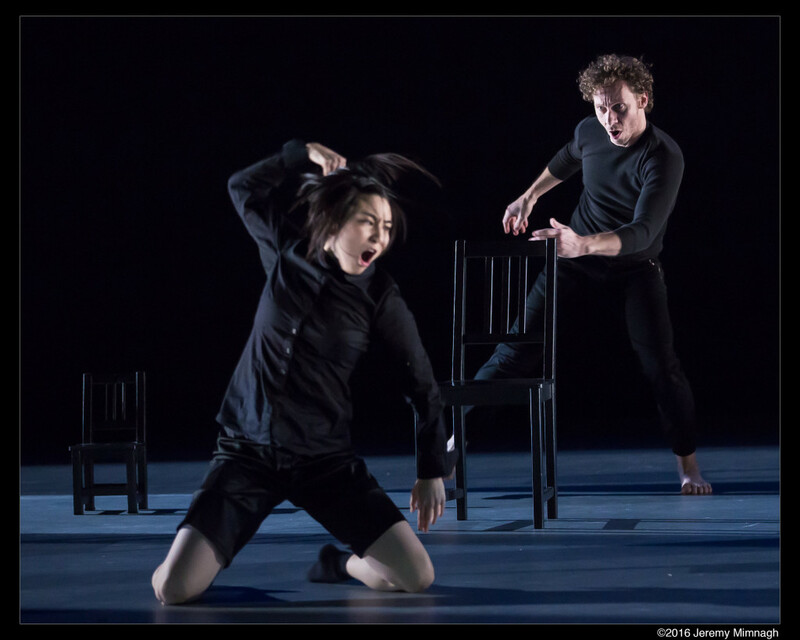 As a dancer, I was so excited to hear this idea explained in the pre-show talk, as I can even now recall movements and feelings of dances from my youth, such the steps I performed in my first-ever modern dance, set to ‘Sledgehammer’ by Peter Gabriel. True to style, there are so many more aspects to this performance than dance alone. The audience is nudged to pay specific attention to the lighting, design by Marc Parent, and it truly becomes an extra character in the space. The creative use of lighting, from harsh to warm, geometric to flooding, completely changes the mood of each piece as they develop. The musical score, as well, is intensely unique. Fides Krucker had joined the company in rehearsal and helped develop a vocal score for the dancers. Having seen vocalizations and text used in dance to varying degrees of success, I was blown away with the work created for the Peggy Baker Dance Company. The dancers’ voices are amplified with such finesse, that sometimes it is unclear who was generating a certain noise, and the sound scatters so interestingly throughout the space. I often find that vocalization speaks deeply to an audience, and Fides Krucker understands this explicitly, developing a soundscape that at once draws you in, makes you uncomfortable, and speaks to you on a personal level. The final layer of Phase Space is the music, performed live onstage and improved each night by John Kameel Farah. Specifically designed to be generated electronically and expelled through wires and speakers, Farah’s sound complements the dancers’ work, and its nature of improvisation makes aligned moments special and wonderful. Although I found the music at times too dissonant and not especially relatable (coming from someone who does enjoy electronic music), I understand and respect the work. Farah’s space onstage, above the dancers, was an interesting way to show his inclusion and mandatory presence to the performance’s makeup. The dancers for the evening, Ric Brown, Sarah Fregeau, Sahara Morimoto, Andrea Nann, and Kate Holden, were all spectacular. What else is to be expected of Peggy Baker’s dancers, let’s be honest. I found myself at times, though, distracted from their incredible skills due to the immensity of other aspects in the performance. I would be lost in thought and passive watching, and suddenly be taken with how beautiful each dancer is, how unique, how fluid and sinewy and just plain magical. The articulation of hands, hips, and ankles all blow me away and the years of dedication and study are evident in each body on the stage. The moments of stillness in each piece were equally as wonderful as the movements. The intention is so clear within each dancer, and their eyes just blaze with passion, depth, and vulnerability. There are endless images that are evoked in combination of movement and vocal soundscape, from chittering squirrels and giggling children, to animal rage, and cooing, sobbing sirens on the sea. Not only was I impressed with the individual skills, but also with the way all participants came together and interacted to create what really feels like something significant on that stage. Finally, I want to address an aspect of the performance that I was not aware of coming in, but that is such a fantastic development for all genres of live theatre. The first row of the Betty Oliphant Theatre is rigged with interesting chairs— Tactile Audio Relative Dimension in Sound seats, or vibrotactile chairs for the deaf or hard of hearing. These chairs are implanted with speakers that are connected to the electronic music of the performance, allowing participants to feel the music with their skin. Hearing Peggy Baker talk about these chairs and the opportunities they present is so exciting, and she gets flushed with enthusiasm. More information on the mechanism of the chairs and the creators can be found here. Phase Space brings together wonderful aspects of the senses, and is a truly thrilling and intellectually complex performance to see. I am excited to see how the company expands from here, and am grateful for an evening of complex thought. Phase Space is playing at the Betty Oliphant Theatre January 22-24 & 27-31.